19. Can nanotechnology meet society’s grand challenges? 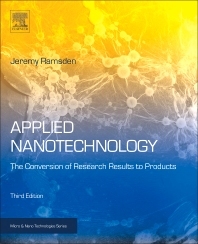 Applied Nanotechnology: The Conversion of Research Results to Products, Third Edition, takes an integrated approach to the scientific, commercial and social aspects of nanotechnology, exploring the relationship between nanotechnology and innovation, the changing economics and business models required to commercialize innovations in nanotechnology, and product design challenges that are investigated through case studies. Applications in various sectors, including composite materials, energy and agriculture are included, as is a section on the role of the government in promoting nanotechnology. In addition, the potential future of molecular self-assembly in industrial production is discussed, along with the ethics and social implications of nanotechnology. This new edition begins a concise introduction to nanotechnology, carefully explaining the relationships between science, technology, wealth and innovation. Next, it focuses on actual products and processes, including the big three areas of application, health, IT and energy. Different types of nanobusiness (upstream, downstream, ancillary etc. ), are also carefully delineated, and aspects such as design and realization (e.g., actual fabrication) are also covered, amongst other timely topics. This book offers a vision of the role of nanotechnology in confronting the challenges facing humanity, from healthcare to climate change. Jeremy Ramsden was educated at the Universities of Cambridge and Princeton and the Ecole Polytechnique Federale de Lausanne (EPFL), where he obtained his doctorate in the Institute of Chemical Physics for research into photocatalytic semiconductor nanoparticles. He was a visiting scientist at the Biocenter (Institute of Biophysics) of the Hungarian Academy of Sciences in Szeged (1987), after which he worked at the Biocenter (Institute of Biophysical Chemistry) of the University of Basle (member of the Faculty of Natural Philosophy) until being appointed (2002) Professor and Chair of Nanotechnology at Cranfield University in the UK. From 2003–9 he was also Research Director for Nanotechnology at Cranfield University at Kitakyushu in Japan. In 2012 he moved to the University of Buckingham (UK) as Honorary Professor of Nanotechnology. His main research focus nowadays is on nanosensors. He is a Fellow of the Institute of Materials, Minerals and Mining (London) and a IUPAC Fellow.